THE ROMULAN WARS completes its FINAL EPISODE “The Tunnel at the End of the Light”! On May 13, 2005, Star Trek: Enterprise aired its series finale, “These Are the Voyages”–completely skipping over a half-decade of the much anticipated Romulan War with Earth and the Coalition of Planets. Many fans were, quite understandably, disappointed. In addition to strengthening the alliances that would form the Federation and shaping the very direction of Starfleet technology from pure exploration into vessels that could also fight and defend, the very nature of the Romulan War promised action and drama that the fifth Star Trek television series (sixth if you count the animated series) had not previously been able to develop. Two and a half years later, on November 23, 2007, Star Trek fans began to fill in that missing half-decade with a new fan series: STAR TREK: THE ROMULAN WARS. Led by show-runner LEE GARTRELL, this Arkansas-based production didn’t have the financial resources or the professional polish of a Star Trek: New Voyages or Starship Exeter, but what they did have was passion and commitment. They sewed their own costumes, built their own simplified sets, green-screen composited in backgrounds behind their actors, and created their own VFX. Over the course of the next eight years, The Romulan Wars would release nine full-length episodes ranging in length from 22 to 45 minutes (nearly four and a half hours of content!). Their previous offering, a prequel episode entitled “The Atlas,” was released a year before the fan film guidelines were ever announced. At the time, Lee Gartrell was planning for a full run of 16 episodes to finish up the war. Unfortunately, Guideline #1 prohibits continuing series. 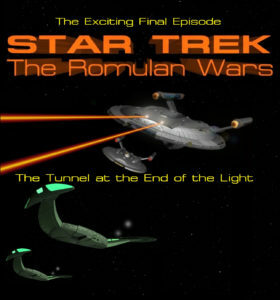 So The Romulan Wars is wrapping up with their tenth episode, “The Tunnel at the End of the Light.” Part 1 was released back in May with a running time of 23 minutes (slightly over the 15-minute limit). A few weeks ago, the full final episode was completed and released with a total run time of 37 minutes (I doubt CBS will mind). Although this is the end of The Romulan Wars, Lee Gartrel is already planning the team’s next project: an original sci-fi series set 790 years in the future. It should premiere next summer. You can view all the previous episodes of The Romulan Wars here. Previous Previous post: Congratulations to ADAM NIMOY and TERRY FARRELL on their ENGAGEMENT!